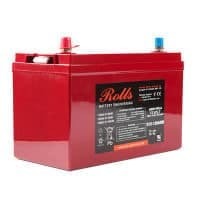 The Rolls Surrette S12-128AGM (S12128AGM) Deep Cycle Battery features a high cycle life without the need for maintenance. The AGM technology (Absorbed Glass-Mat) keeps the electrolyte (Acid) contained in the glass mats allowing the S12-128AGM (S12128AGM) to not expel any liquids even under severe overcharge. The S12-128AGM (S12128AGM) is a non-hazardous battery resulting in lower shipping costs and can also be shipped via air. AGM batteries have an extremely low internal resistance giving them a very low selfdischarge rate. Rolls Surrette takes the Group 31 size battery to even higher levels by improving the capacity and service life. This battery is heavier than the typical Group 31 type, and is unsurpassed in reliability. The Rolls Surrette S12-128AGM (S12128AGM) is a direct AGM replacement for any Group 31 lead acid batteries. The S12-128AGM (S12128AGM) is a 12 volt battery with a capacity of 128 Amp Hrs. @ 100 Hr. rate or 115 Amp Hrs @ 20 Hr. rate. The terminals are brass auto posts with top threaded inserts.